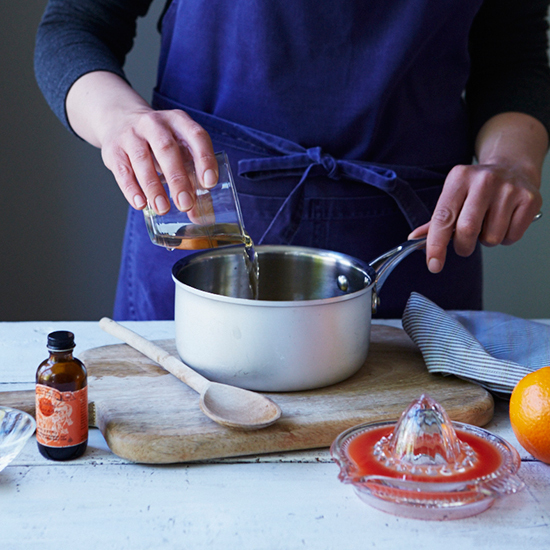 Chef Ludo Lefebvre modernizes a French classic with orange blossom water and ras el hanout. In a small saucepan, bring the honey to a boil over high heat. Add the juice, stock, vinegar, orange blossom water and ras el hanout. Return to a boil and cook over moderately high heat until reduced by half (to about 1 cup), 16 to 18 minutes. Off the heat, whisk in 2 tablespoons of the butter. Season with salt and pepper; keep warm. Meanwhile, preheat the oven to 425°. 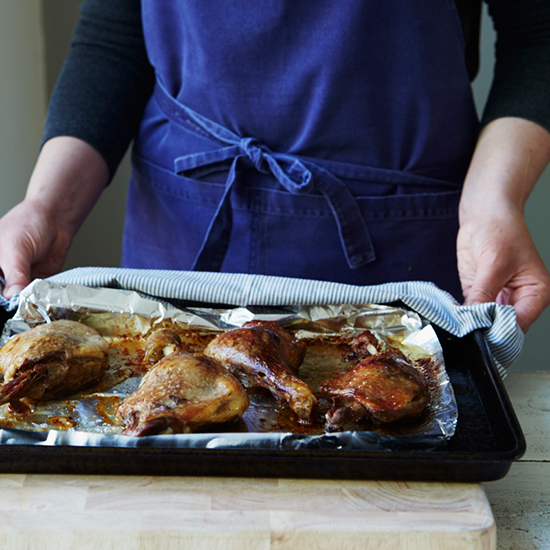 Place the duck legs on a foil-lined rimmed baking sheet and roast until heated through and browned, 14 to 16 minutes. Transfer to a plate and tent with foil to keep warm. 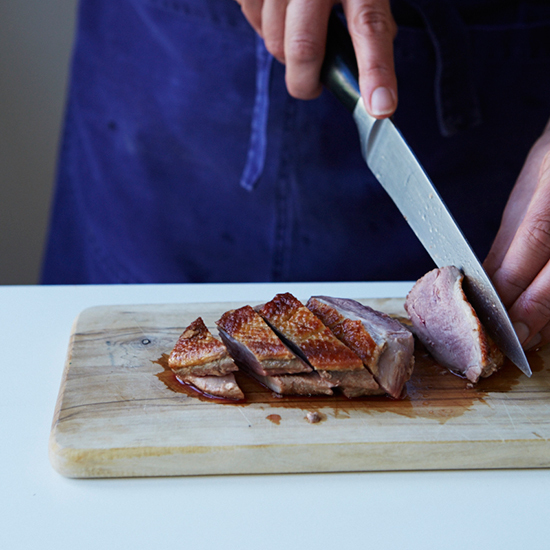 Using a paring knife, deeply score the skin of each duck breast every 1/2 inch in a crosshatch pattern; season with salt. 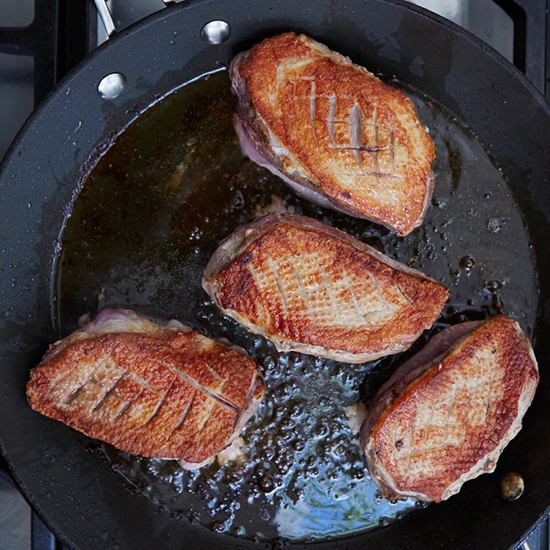 In a large skillet, arrange the duck breasts skin side down. Place the skillet over moderately low heat and cook, without turning, until some of the fat has rendered and the skin is golden brown, 14 to 16 minutes. Turn the breasts and cook until medium rare (130º internal temperature), 2 to 3 minutes longer. Transfer to a cutting board and let rest. Drain the fat from the skillet and save for another use; reserve the skillet. 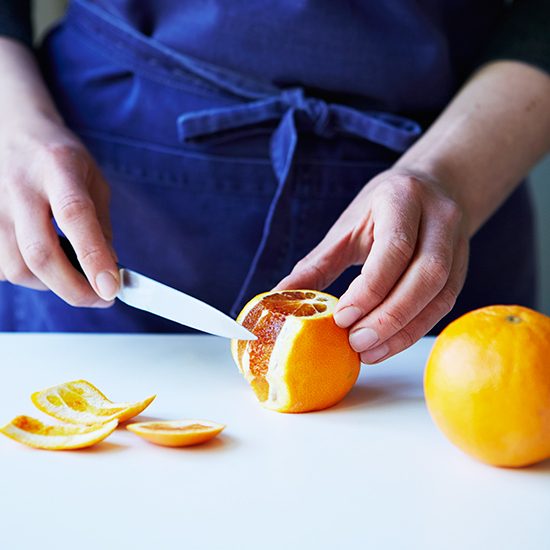 On a cutting board, trim the ends from each blood orange and then slice away all the peel and pith. Cut each orange crosswise into 1/4-inch slices, then halve the slices. Return the skillet to high heat and melt the remaining butter. 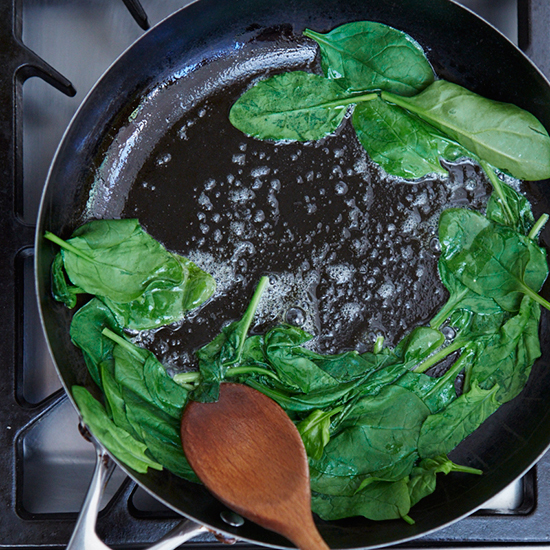 Add the amaranth leaves and swirl the skillet until they are wilted and fragrant, 20 seconds. Arrange the breasts and the amaranth on plates and drizzle with the sauce. 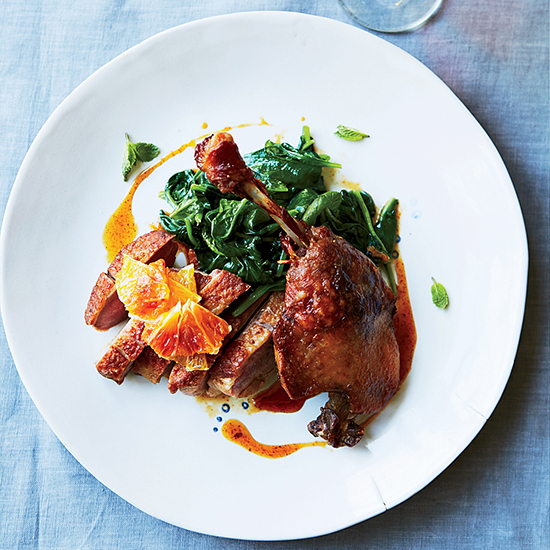 Top with the duck legs and orange slices and garnish with mint leaves.